Nvidia’s GeForce FX, need we say more? It was surrounded by rumors and claims of it’s stellar performance made headlines left and right. Therefore it was poised to take the performance crown away from ATi at launch. Naturally Nvidia was keen on keeping the rumor mill turning at an ever increasing rate as they prepared to launch the first sibling of a new architecture. Cinematic computing, CineFX Engine, Intellisample Technology, are all new industry buzz words sprouted from the minds of the ever inventive marketing department at Nvidia. But as always it is the performance that counts, not the marketing mumbo jumbo that Nvidia's PR department has been feeding us for the past few months. It has been a long wait as the GeForce FX is no less than 6-months overdue and the 3D landscape has changed significantly despite Nvidia’s attempts to lure prospective buyers away from ATi’s products with performance claims for the FX of up to 40% faster than a Radeon 9700 Pro. Fig 1. 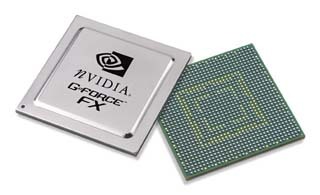 The Nvidia GeForce FX chipset with integrated heatspreader in BGA, Ball Grid Array, packaging. Speaking of buzz words and new features when was the last time a 3D graphics card brought anything revolutionary to the table, something which would justify the high pricetag of most new cards? As most users don’t need the cutting edge 3D performance anyway and rather opt for something a little slower and less expensive, as a good example, just look at how popular Nvidia’s GeForce4 Ti 4200 and ATi’s Radeon 9500 are. These cards represent the bulk of products both Nvidia and ATi ship and usually end up generating ‘design wins’ when they land a major deal with one of the OEMs and subsequently end up in countless OEM boxes. That is where all of the real money is made, not those few high-end cards that are being sold at a too high a price to the enthusiast community. In Nvidia’s case however the bulk of their revenue from the last quarter comes from their participation in Microsoft’s Xbox for which they designed some key components, not from the sales of their high-end 3D graphics products.